In our fast-paced world, so many things seek to divert our attention. Distracted driving has become a major cause of automobile accidents. Yearly, thousands of people are injured or killed due to a distracted driver. 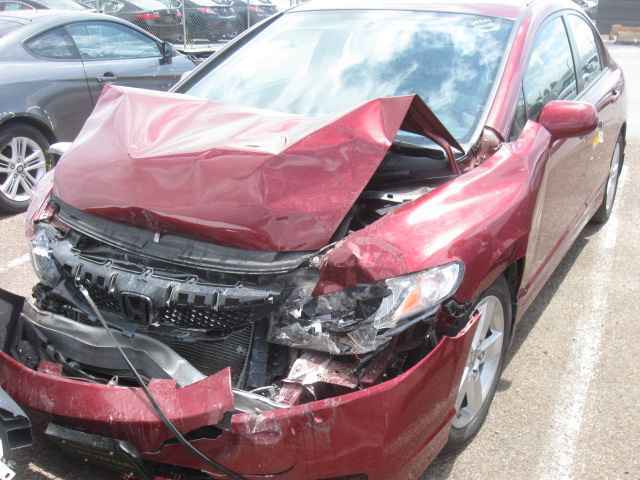 The picture below shows a car involved in a recent automobile accident handled by our firm. In that case, the teenage driver was looking away from the roadway while she changed songs on her cellphone. When she looked back at the roadway, it was too late to stop for a red light. Her distracted driving caused a chain collision damaging four cars and injuring several people. Distracted driving can take many forms. Among all forms of distraction, texting is probably the most discussed. Why do we focus much of our attention on texting? Several reasons warrant the attention on texting. Many of these reasons relate to the wide-spread use of texting as a communication and its acceptance as a normal form of communication among younger drivers. Manual Distractions. These are activities where the driver moves his or her hands away from controlling the car. Think of the driver who reaches into the backseat for something while driving. Visual Distractions. These are activities where the driver focuses his or her eyes away from the roadway. Think of the driver looking into the backseat while the car moves forward. Or, perhaps the driver is looking down at a map while driving. Cognitive Distractions. These are activities where the driver’s mind wanders away from his or her task of driving. These drivers are not focused mentally on the task of driving the vehicle. Some distractions involve more than one of the categories. Texting is especially dangerous because it involves ALL THREE categories at the SAME time. When a person texts, they take their mind, eyes and hands from the task of driving. At a speed limit of 55 miles per hour, a texting driver can easily travel longer than the length of a football field without paying any attention to the roadway. That’s tremendously dangerous to other drivers, passengers and pedestrians. Texting while driving presents a tremendous danger on our roadways. However, the number of injuries from texting and other driver distractions can be reduced. We must start with awareness and education. With texting, education can have a huge impact in teaching younger drivers to develop safe habits now for a lifetime on our highways.